Demandbase officially announced ABM Analytics during its annual ABM Innovation Summit in San Francisco earlier this month. The new tech, part of the company&apos;s account-based marketing platform, leverages its account identification technology to help marketers analyze performance from advertising to pipeline and revenue figures, David Jones of CRM Buyer reports. "Artificial intelligence gives business-to-business marketers a clear view into the behavior of their target accounts," said Peter Isaacson, CMO at Demandbase. "In the past, B2B marketers have had access to basic filmographic information about their audiences, such as names, titles, phone numbers," he told CRM Buyer. AI takes this basic insight and provides information to help marketers understand what their target accounts are interested in, across the Web, Isaacson said. The technology allows marketers to view comparisons of various accounts within targeted revenue parameters, or control the metrics to identify companies with different segments of employees, or show how campaigns are performing at different states of the sales funnel, Isaacson said. Demandbase has been testing ABM analytics with several different customers. It has enabled some of them to couple disparate data sources -- for example, Web engagement and CRM data -- for the first time, allowing them a better understanding of their business impact. "Not only has it delivered insight into how their ABM campaigns are performing, but it has also opened up new doors for testing and optimization," Isaacson said. The company earlier this year launched its AI-based conversion solution, which integrates with Salesforce, Slack and LinkedIn Sales Navigator to reach target accounts and develop insights. Artificial intelligence last year grew at an accelerated pace with real-use cases in sales and marketing, noted Cindy Zhou, principal analyst at Constellation Research. "AI is already revolutionizing marketing by helping marketers target the right audience with relevant offers based on their areas of interest, the core of ABM," she told CRM Buyer. "Instead of a manual process, AI can quickly help marketers analyze existing data sets to find ideal customer profiles and make suggestions on the best options." Demandbase&apos;s 2016 acquisition of Spiderbook, a data science firm, allowed it to infuse AI and automation capabilities into large data sets, noted Wayne Cichanski, vice president of search strategy at iQuanti. "This can identify data trends that would predict the [likelihood] of a company to make a purchase, to uncovering the right buyers within those flagged accounts," he told CRM Buyer. The technology allows billions of Web pages, keywords and profile interests to be scanned and mapped into predictability matrix, offering far more insight than traditional demographic information, Cichanski said. Separately Demandbase announced the extension of its ABM collaboration with Salesforce Pardot, which integrates contacts and account information in the Salesforce system with its AI-based data from the Demandbase Conversion Solution. The integrated data will allow ABM teams to see everything -- from which Web pages a targeted account has viewed to the keywords and issues used for online searches. 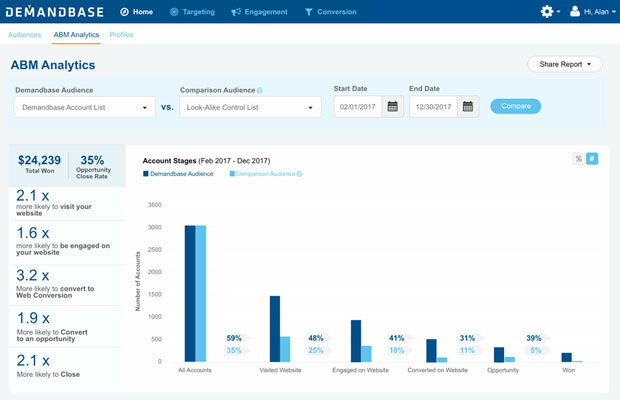 "Customers of Salesforce Pardot and Demandbase will be able to leverage contact and account records from Salesforce Pardot with real-time intent data and account insights from Demandbase," said Nate Skinner, vice president of product marketing at Salesforce Pardot. The integration is meant to allow joint customers of the two firms to better engage existing and prospective customers.